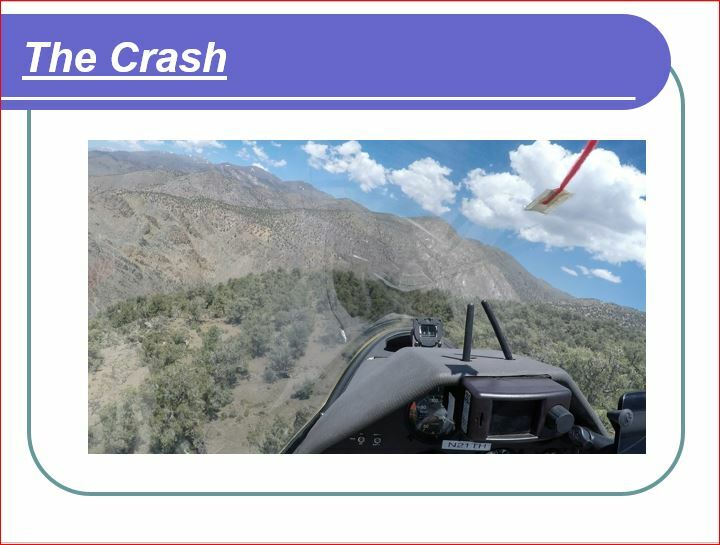 This presentation is all about the day I crashed a glider onto the White Mountains just East of the Bishop airport. I will cover not just WHAT happened, but more importantly, I will cover my path to discovering the ROOT CAUSE of WHY it happened. 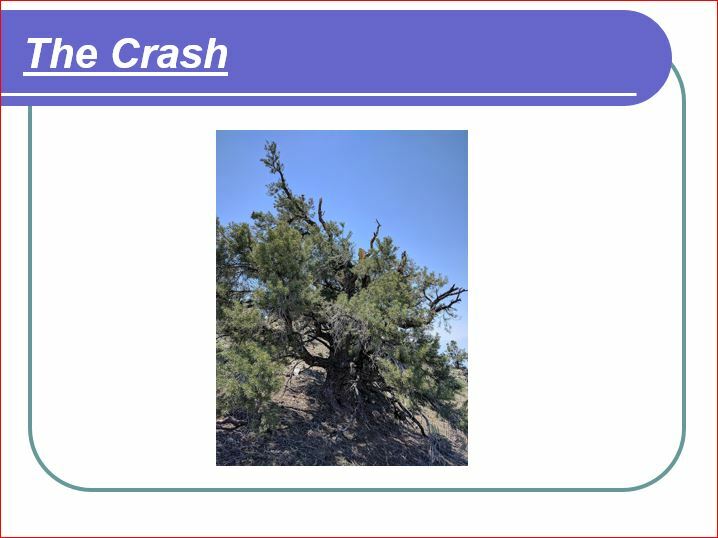 I will then conclude my presentation with my personal LESSONS LEARNED. 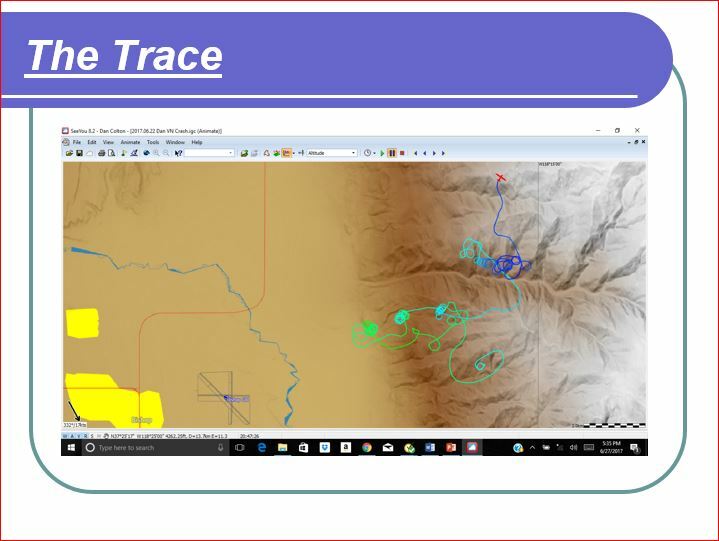 It is my hope that this presentation will enhance gliding safety and prevent at least one serious accident in the future. I had literally been planning this specific flight for the past three years. 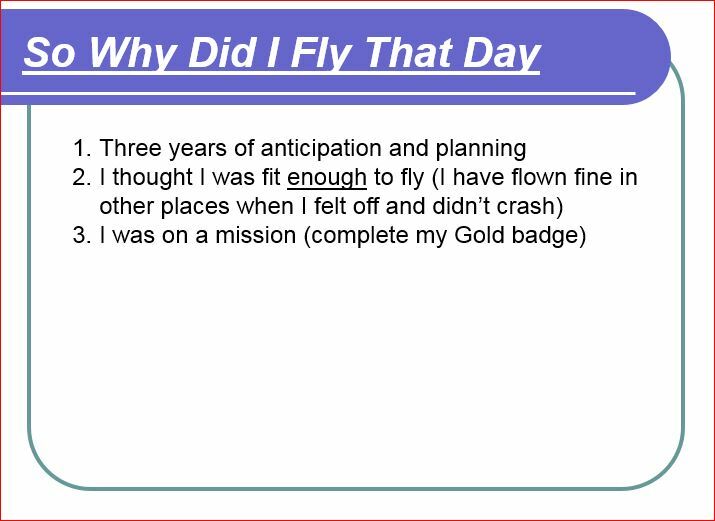 The flight started out with an amazing prospect for the successful completion of my Gold badge and possibly even adding a 500km diamond. 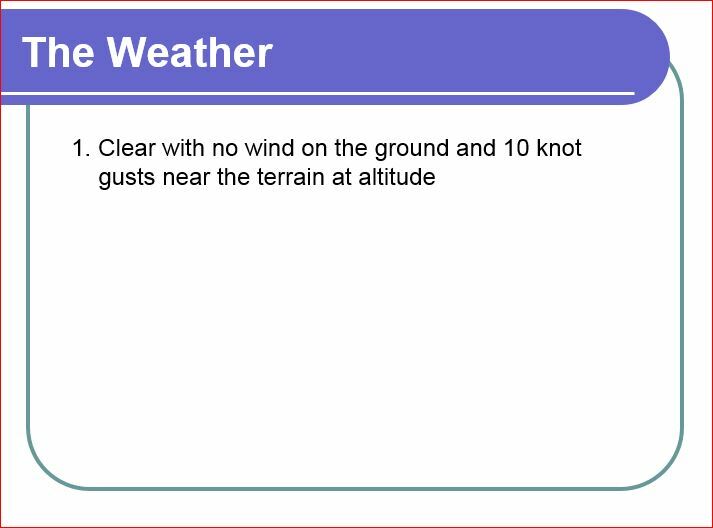 5) not accounting for wind shear and gusts close to terrain. 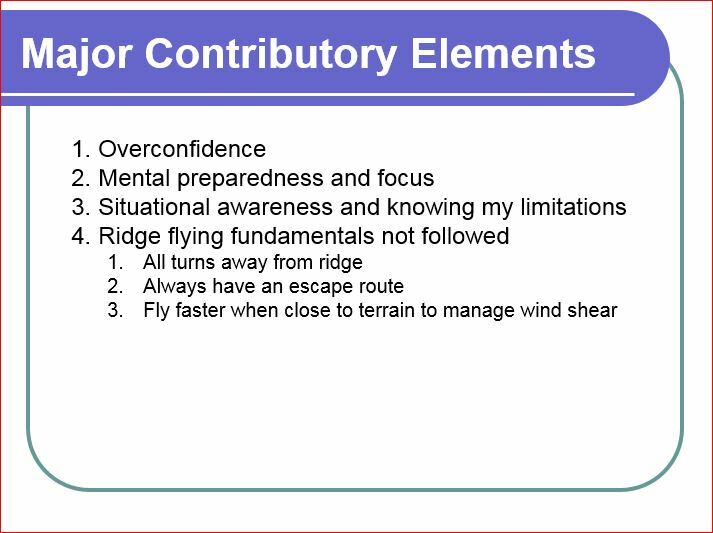 I understood these hazards intellectually but I executed the flight poorly and put myself into an extremely dangerous situation. 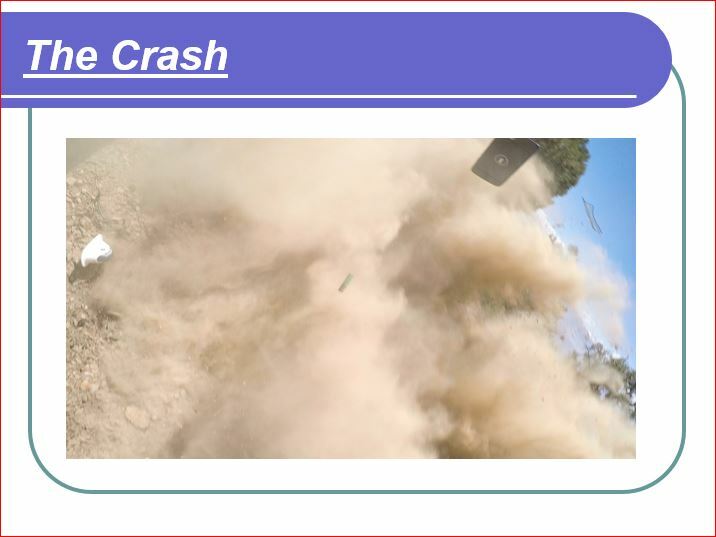 This next series of slides show WHAT happened. Immediately prior to this picture being taken I was at 50 KIAS, the wind noise suddenly stopped, and the floor fell out from under me. It was clear to me that I was going to impact the ground and could see pretty much where it would occur. 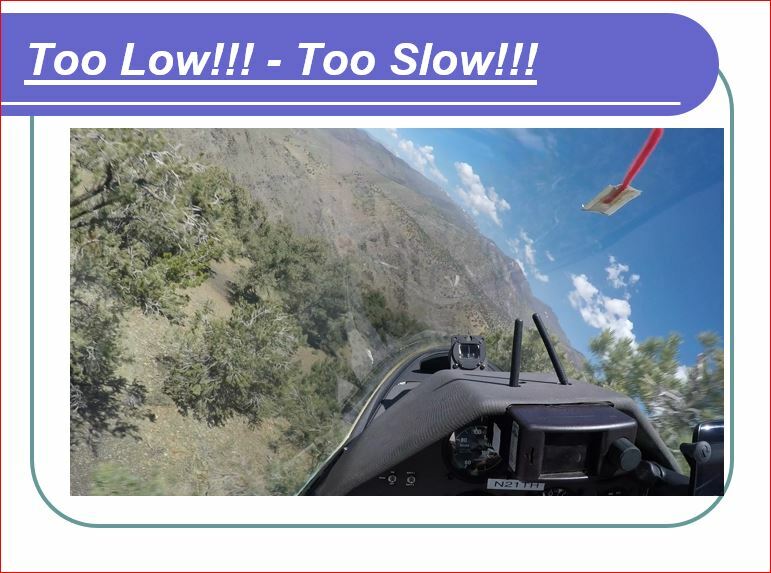 I lowered the nose of the glider to regain whatever level of control I could so I could perform a minimum energy crash into the tree tops. 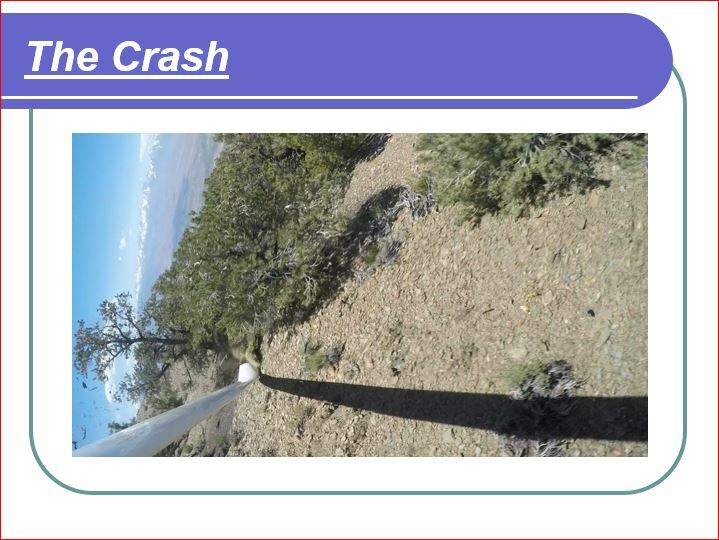 This picture shows the point where I begin raising the nose of the glider to reduce the energy prior to the crash. 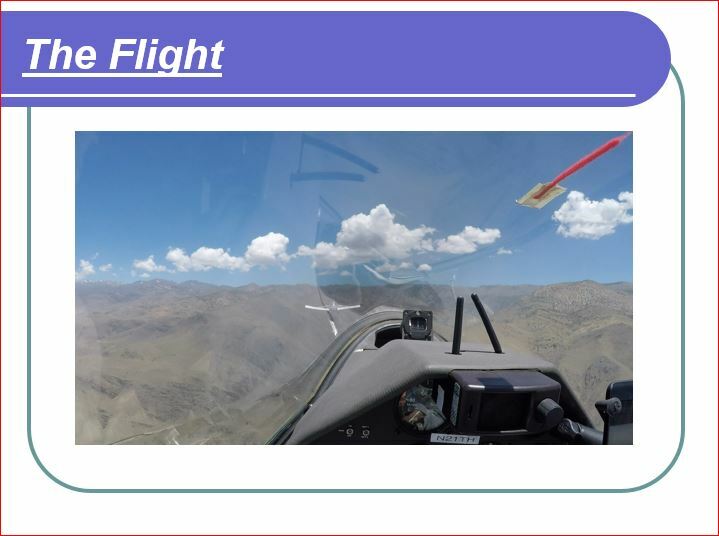 I am barely above the tree tops and under the stress of an imminent crash I INCORRECTLY input opposite aileron as the left wing dropped inducing a spin. 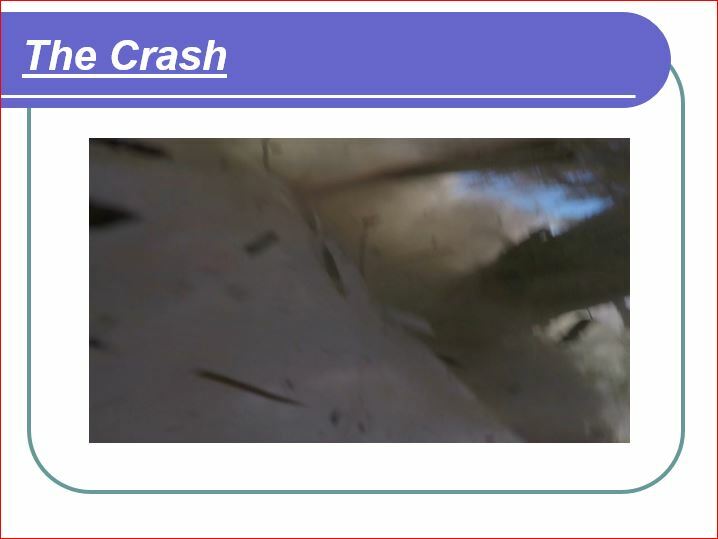 The right wingtip hits the ground and the wing buckles at root. 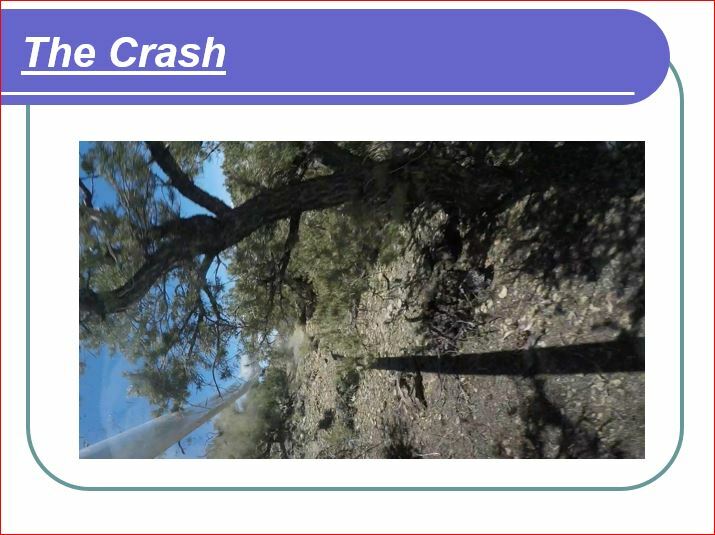 The camera is now flying outside the glider with the other debris. 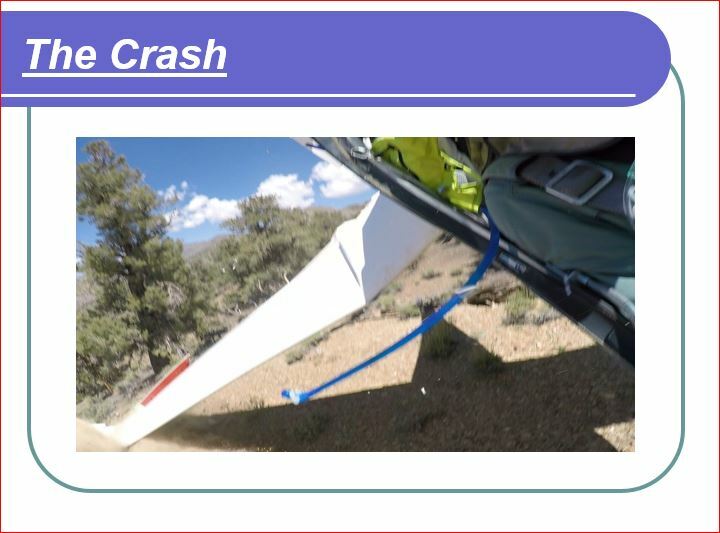 Here you can see a wingtip wheel, a battery from the FLARM, my PDA, and a piece of the canopy as the glider is now sliding backwards down the hillside. Now that everything has finally stopped moving I start thinking about how badly I might be injured and what to do next. My immediate thoughts go to the blood running down my forehead and wondering if I have any broken bones. 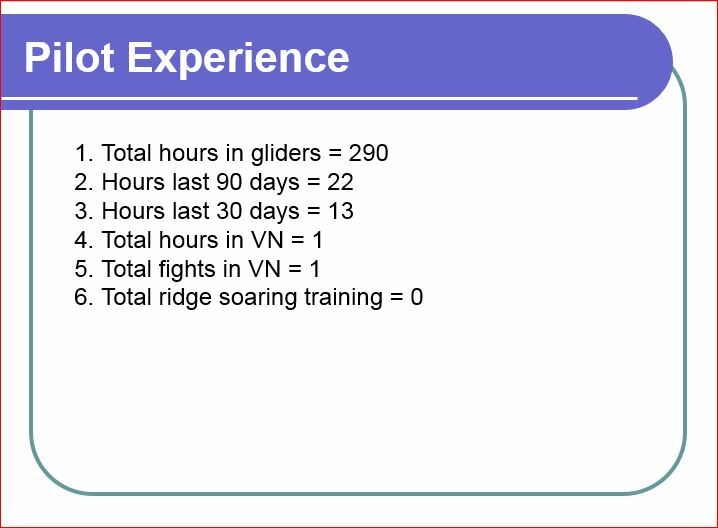 I have not yet seen the condition of the glider. And when I stand up and step out of the glider I see the carnage and it sinks in that I have just destroyed the newest addition to my club’s fleet of gliders and I’m devastated. But I’m OK and it’s time to figure out how to get rescued. 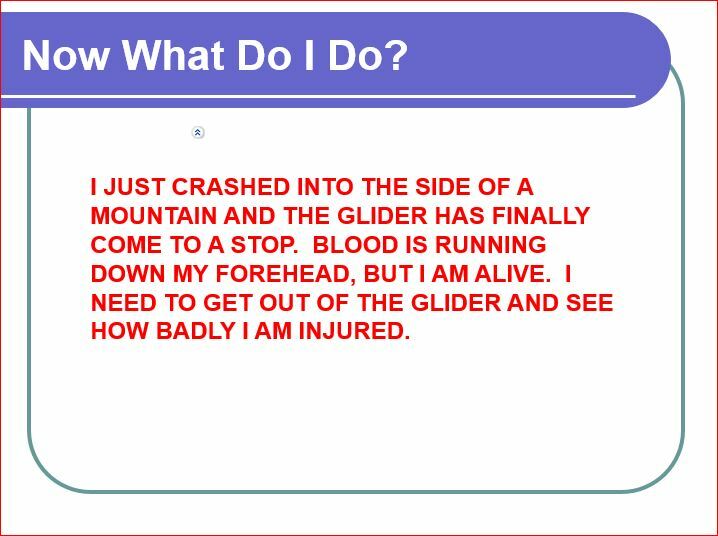 So I made my first radio call that I had crashed and that I was OK.
An important note here is that I pondered walking out and decided that it was best to stay with the glider for three reasons: 1) it is easier to see the glider than me because they would probably be looking for a glider and not a hiker; 2) the altitude, heat and steep/rocky terrain would make travel risky due to the obvious physical hazards and lack of any access roads or paths; and 3) I considered that my injuries might be more serious than they initially appeared. It was quickly apparent to me that the Shempp-Hirth safety cockpit design helped save my life. It uses a stiffened carbon fiber layup from the front bulkhead to the rear bulkhead in combination with Kevlar that does not shatter and crack like fiberglass and carbon fiber do. The Kevlar has a mushy crushing property that absorbs energy as it hits things. 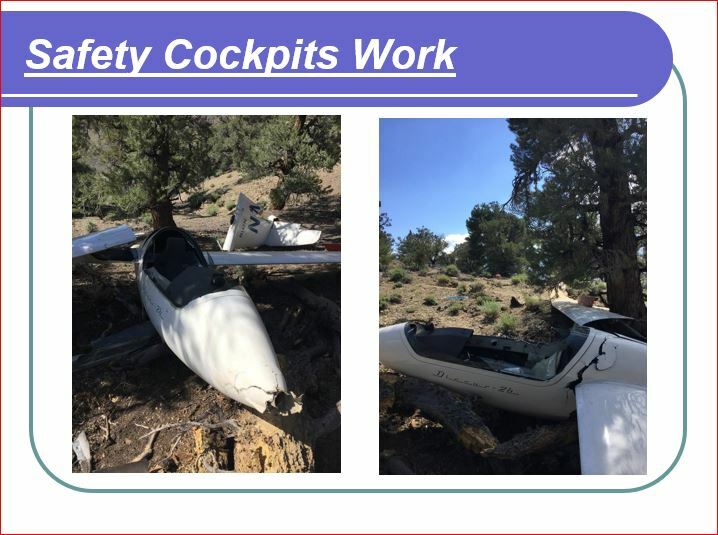 As you can see everything on the glider broke away absorbing significant energy during the frontal, sideways and rearward ground impacts and the cockpit remained totally intact, other than the Plexiglas canopy which shattered and flew in all directions. 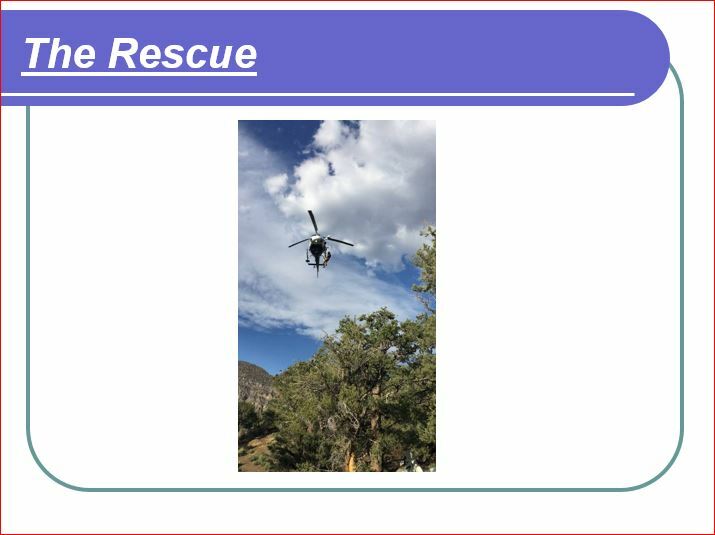 There were many people involved in coordinating my rescue including the two pilots in the BASA DG1000 circling overhead for over an hour to help others locate me, my SOS call from my SPOT that provided exact coordinates, the airport manager who was coordinating from the ground, rangers searching from the roads, and ultimately the CHP search and rescue team from Fresno who brought me down off the mountain. 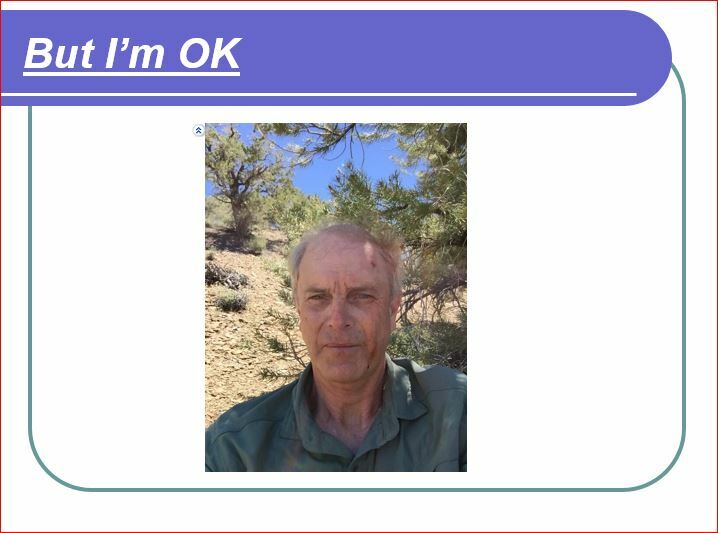 I was fortunate to have a well stocked landout kit including SPOT, food, water, jacket, blanket, first aid kit and a working handheld radio as the electronics in the glider were no longer functional. I was also lucky that there was a signal for my cell phone. 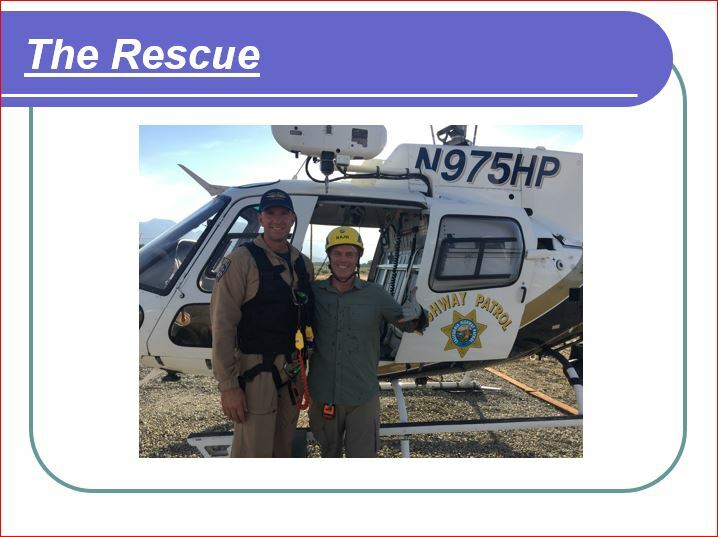 Between the cell phone and handheld radio I was able to maintain communication with everyone involved in the rescue throughout the process. There were several parties that NEEDED to be notified. They included…. 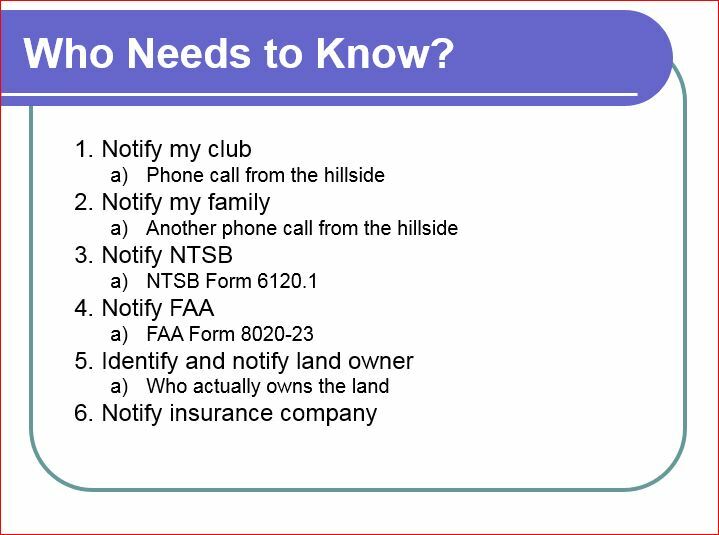 I found support from my flying club and fellow pilots, as well as the FAA, in ensuring my safety going forward. While any of them could have pulled my wings at any time they all expressed a sincere interest in my recovery and future safety. 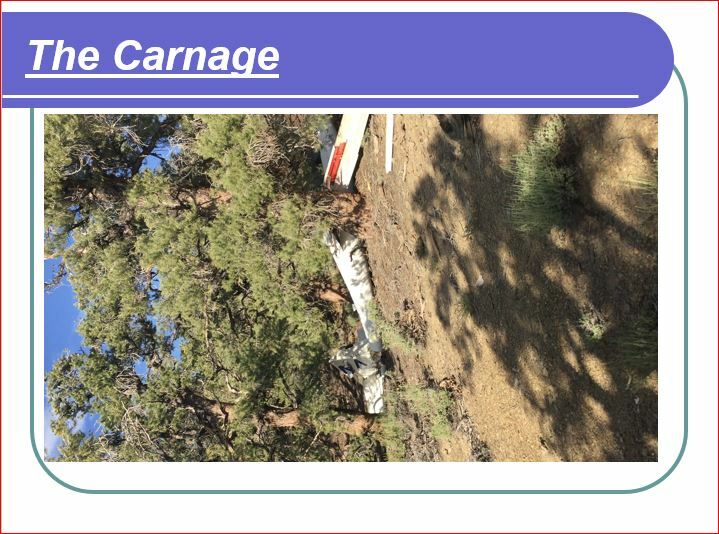 To start my flight analysis I felt that it was important to look back a few years to fully understand the circumstances leading up to the accident. I was an avid pilot and set on fast-tracking my flying career. I studied every book, article and video I could get my hands on. 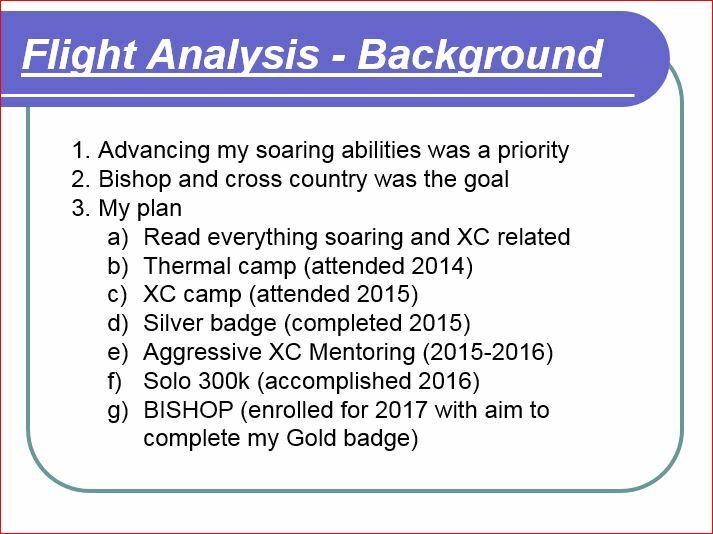 I set my sights on camps, mentoring, badges and set goals to improve my soaring and cross country skills. And I felt like I was solidly on track toward achieving my goals. But there was something big missing in my plan. 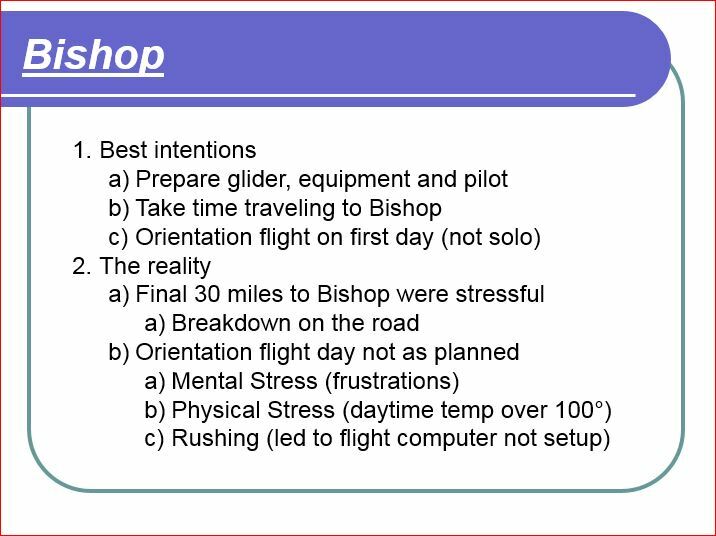 I had the best intentions for setting myself up for success at Bishop but there were several hiccups on the two days prior to my accident. 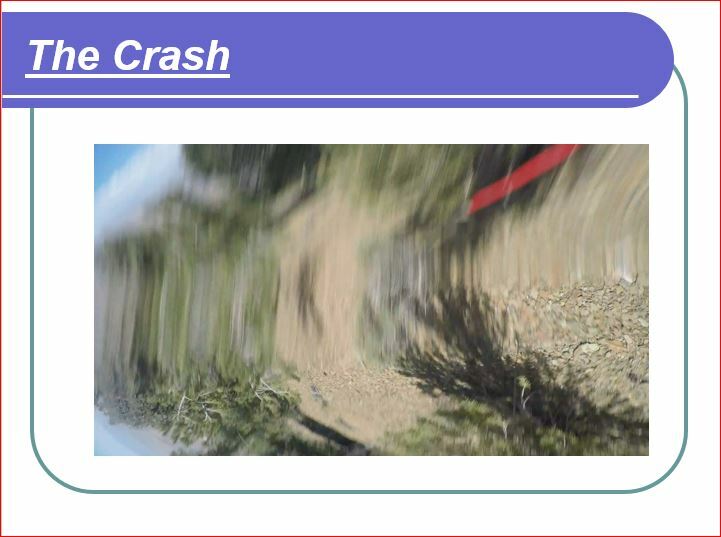 And as you saw from the earlier slides my frustration carried forward to the morning of the flight and even on into the flight. 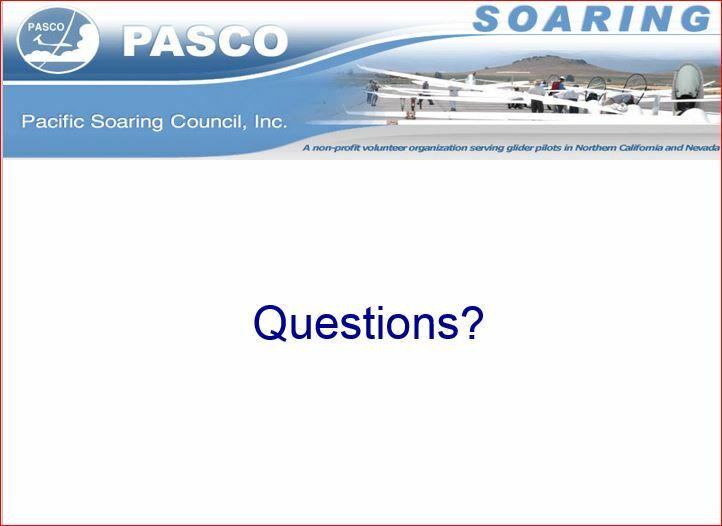 So I question myself regarding not only WHY DID I FLY THAT DAY, but also WHY DID I CONTINUE THE FLIGHT WHEN IT WAS GOING SO POORLY. I think the answer is a combination of overconfidence and that I let my personal investment in these three goals direct my decisions. 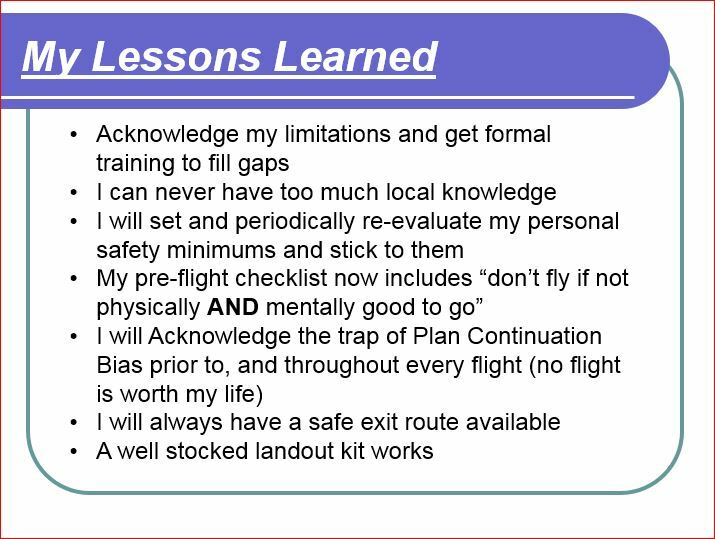 My head was telling me to stay on the ground prior to the flight, and later on, to end the flight early, but I allowed my ego to overrule my common sense. This is a condition called Plan Continuation Bias. 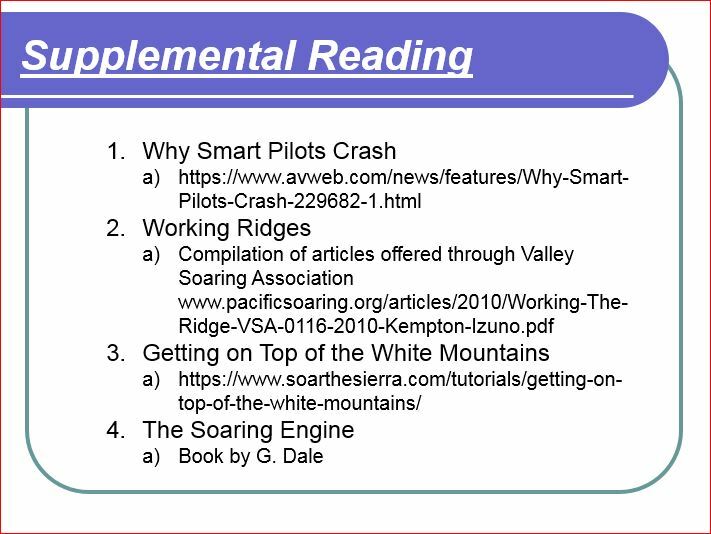 There is also an excellent article on this in the references slide at the end of my presentation. 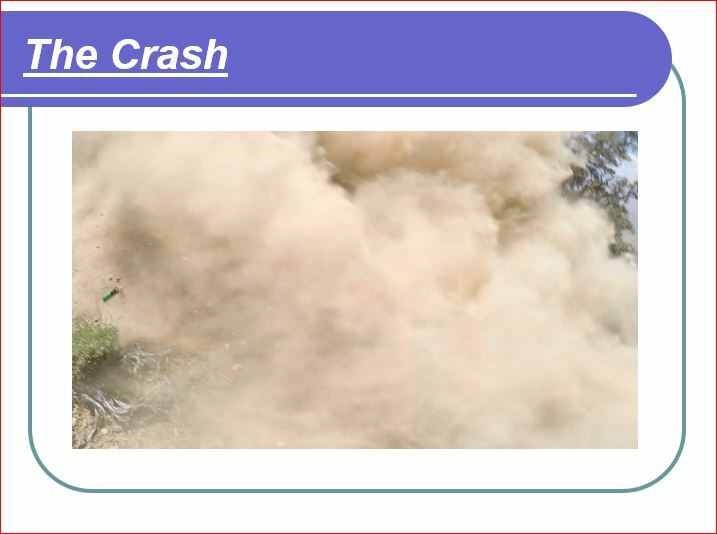 Some people have asked me how I will make sure I don’t crash again in the future. I think the path to address the gaps in my flying skills was pretty straight forward. But the harder part for me was to figure out how to create a safety net that will let my common sense prevail when my ego is not looking out for my own best interest. 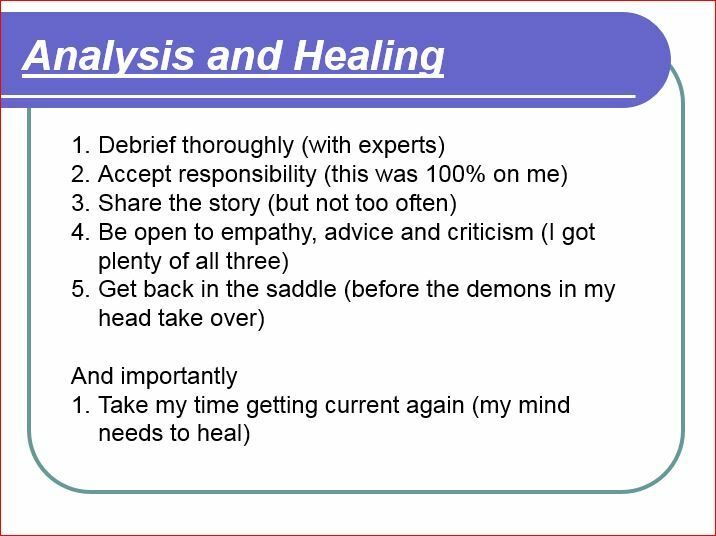 For me the process of analysis included a lot of private and public discussions with the goal of thoroughly understanding what happened, why it happened, and me personally accepting responsibility. The physical and mental healing and getting back into flying was secondary and not to be rushed.